In a large heavy skillet over medium high heat, melt the butter, then stir in the onion, garlic, ginger, 1 teaspoon salt and 1/2 teaspoon pepper. Cook, stirring occasional;l;y, until the onion is golden, 6 to 8 minutes. Stir in the mustard seeds, cumin and coriander and cook until the mustard seeds start to pop, about 1 minute. 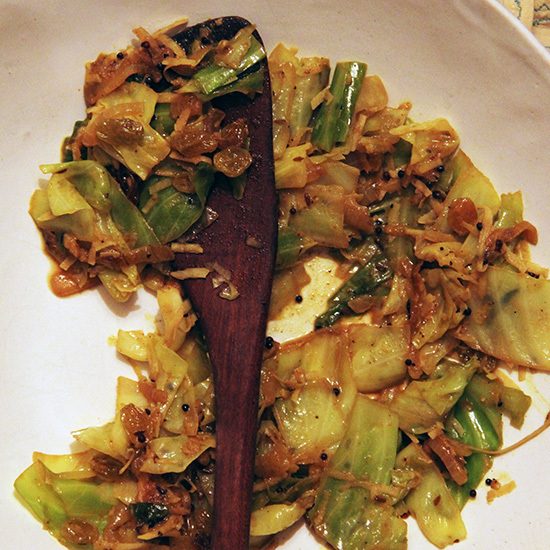 Stir in the cabbage, water, coconut, and raisins and cook, covered, until the cabbage is tender, 10 to 12 minutes. Uncover the skillet and boil until all the liquid has evaporated, about 5 minutes. Season with salt and pepper to taste and serve.